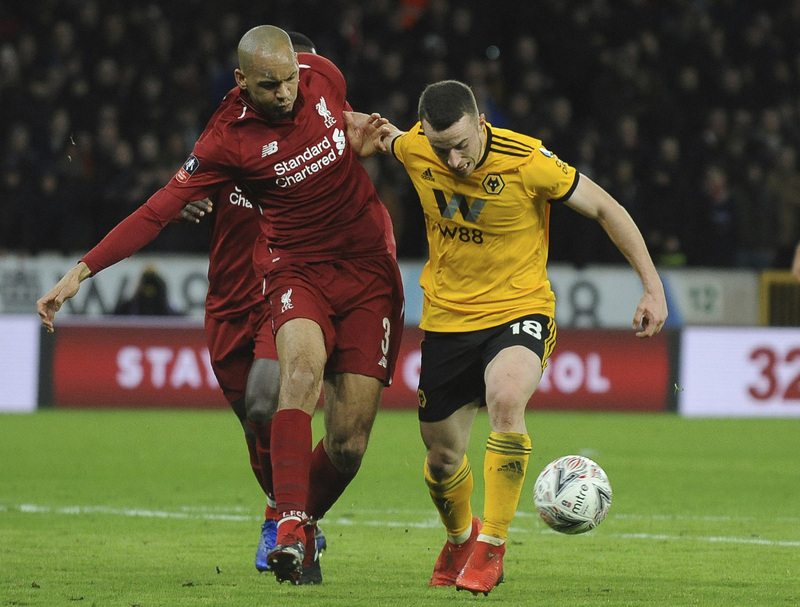 A makeshift Liverpool team containing three teenagers making their senior debuts was beaten by Wolverhampton Wanderers 2-1 in the third round of the FA Cup, with a 30-meter strike by Ruben Neves sealing the win on Monday. Liverpool manager Juergen Klopp showed where the competition ranked on the current English Premier League leaders' list of priorities by leaving star forwards Mohamed Salah and Roberto Firmino on the bench until the 70th minute, and they failed to have an impact after coming on. "I changed a lot because I thought we had to, not because I wanted to," said Klopp, who justified fielding a weakened team by saying some of key players were absent because of illness or "little problems." Klopp, who also used the wind as a reason for his team's below-par display at Molineux, has yet to progress beyond the fourth round of the FA Cup in his four seasons in charge of Liverpool. Wolves went in front through striker Raul Jimenez in the 38th minute after James Milner lost possession in central midfield, but Liverpool equalized when Divock Origi scored from the edge of the area in the 51st. Neves regained the lead for Wolves four minutes later, striking a low and fierce shot inside the near post past the initially unsighted Simon Mignolet. Klopp started midfielders Rafael Camacho and Curtis Jones - aged 18 and 17, respectively - and sent on another debutant in 16-year-old Dutchman Ki-Jana Hoever in the sixth minute after center back Dejan Lovren sustained a hamstring injury. Hoever, at 16 years and 354 days, became the youngest Liverpool player in FA Cup history and the third-youngest player to make a senior appearance for the team. Hoever's introduction meant Liverpool played the majority of the match with a 16-year-old debutant and a Brazil midfielder, Fabinho, as its central-defensive partnership. "I am not sure what you all would have said if immediately from the beginning our center-half situation was Fabinho and Ki-Jana," Klopp said. "Then probably a few very smart people would tell me that I don't respect the competition or whatever." Only in the second half did Liverpool find its stride. Xherdan Shaqiri came closest to forcing a replay when he curled in a free kick that was tipped onto the post by Wolves goalkeeper John Ruddy. Liverpool has won the competition seven times, but not since 2006. The Reds lead the league by four points after 21 games and are through to the round of 16 in the Champions League, with those competitions now Liverpool's only chance of silverware this season. Some of the momentum in its season might have been lost, with the defeat to Wolves coming four days after a 2-1 loss at Manchester City - its first league defeat of the season. Klopp, who is without injured center backs Joe Gomez and Joel Matip, was unsure about how long Lovren would be out. "I asked everybody, no signs, nothing, just out of the blue," Klopp said of Lovren's injury.